So how will Trump try to expand vocational education and make college more affordable? It’s not clear. Ideally, Trump should work to phase out the various federal loan programs and higher ed subsidies that a mountain of research has shown are fueling rapid tuition inflation. Unfortunately, Trump has previously proposed an income-based student loan repayment plan. Such a policy could assist borrowers in repaying loans, but it would still create perverse incentives that fuel tuition inflation and overconsumption of higher ed while leaving the taxpayer on the hook for whatever the borrower couldn’t repay. When a student takes out a $35,000 loan to pursue a degree in puppeteering and then surprisingly can’t find a decent-paying job, taxpayers would pick up the tab. There is nothing that is free and that is why we have to cut government spending since we are all paying for this inefficient government!! “We are going to ask every department head in government to provide a list of wasteful spending projects that we can eliminate in my first 100 days.” Source. “We can also stop funding programs that are not authorized in law. Congress spent $320 billion last year on 256 expired laws … Removing just 5 percent of that will reduce spending by almost $200 billion over a ten-year period.” Source. “I may cut Department of Education. I believe Common Core is a very bad thing,” Trump said. “I believe that we should be — you know, educating our children from Iowa, from New Hampshire, from South Carolina, from California, from New York. I think that it should be local education.” Source. “If we save just one penny of each federal dollar spent on non-defense, and non-entitlement programs, we can save almost $1 trillion over the next decade.” Source. “We’re going local. Have to go local. Environmental protection—we waste all of this money. We’re going to bring that back to the states … We are going to cut many of the agencies, we will balance our budget, and we will be dynamic again.” Source. “Waste, fraud and abuse all over the place. Waste, fraud and abuse. You look at what’s happening with Social Security, you look—look at what’s happening with every agency—waste, fraud and abuse. We will cut so much, your head will spin.” Source. I hope my head does spin from cuts, although most of Trump’s proposals are vague and quite timid. Still, I’m hoping that the more the incoming president finds out about the federal budget, the more he will appreciate the need for major terminations. K-12 school subsidies, which generate bureaucracy and stifle innovation ($25 billion). Farm subsidies, which enrich wealthy landowners and harm the environment ($25 billion). Rural corporate welfare, which is handed out by the Department of Agriculture ($6 billion). Energy subsidies, which have been one boondoggle after another ($5 billion). TSA airport screening, which Trump has said is “a total disaster” ($5 billion). The war on drugs, which wastes police resources and generates violence ($15 billion). Excess pay for federal workers, especially gold-plated retirement benefits ($33 billion with a 10 percent cut). Housing subsidies, which distort markets and damage cities ($37 billion). Community development aid, which is corporate welfare used for buying votes ($11 billion). Urban transit and passenger rail funding, which are properly local and private activities ($12 billion). 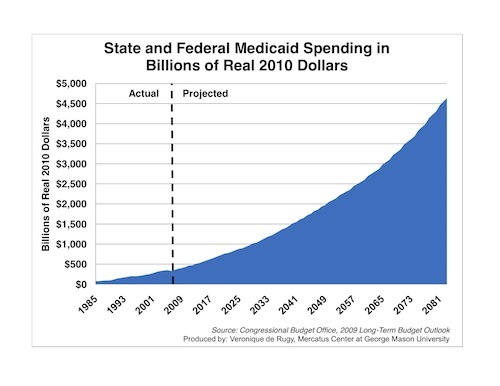 Obamacare exchange subsidies and Medicaid expansion, which should be repealed along with the overall law ($225 billion a year by 2026). President Trump will face major budget pressures in coming years as deficits and entitlement spending soar. Today’s $600 billion deficits are headed toward $1 trillion, and deficits will be even higher if a recession comes along. Federal spending cuts would help avert a fiscal crisis and boost growth by reducing economic distortions. The incoming Trump team should start with some of the cuts here, and there are plenty more proposals at DownsizingGovernment.org. As far as concrete agenda items for a new chair, there are a number of regulations ripe for reform. The U.S. capital markets have seen a marked decrease in the number of initial public offerings (IPOs) in recent years, which many have attributed to the Sarbanes-Oxley Act of 2002 and its onerous reporting and internal controls requirements for public companies. Under new direction, the SEC would be able to investigate what has been depressing interest in IPOs and to pursue strategies to reduce the regulatory burden as necessary. Dodd-Frank imposed several disclosure requirements unrelated to companies’ profitability, a tactic former commissioner Gallagher has called “hijacking” the SEC’s disclosure regime. While many of these disclosure requirements cannot be repealed without an act of congress, the new SEC chair would have the authority to push back against any additional issue-of-the-day disclosures. Senator Warren and others on the left have agitated for a requirement that companies disclose information about political spending; it is unlikely that an SEC chair picked by Trump or his team would pursue such a rule. Finally, a highly technical rule known as Regulation NMS has long plagued the securities exchanges, even some have argued spawning the trading strategy known as “high frequency trading.” A new chair would be well-positioned to reopen that regulation and to evaluate its potential unintended consequences. FRIEDMAN FRIDAY Trump better not start a trade war!!! Ten years ago, I debated Lighthizer in this week-long back-and-forth hosted by the Council on Foreign Relations. His affinity for wanting to bend the WTO to be more responsive to U.S. demands (i.e., “All animals are equal but some are more equal than others”) was very much on display then. The U.S. steel industry has been one of America’s most protectionist and litigious industries for more than a century. Its model was never to compete on economics or commercial considerations. It was always to invest in K Street and use the levers of politics to cordon off the U.S. market for domestic steel. As a trade attorney, Lighthizer brought hundreds of antidumping and countervailing duty cases against foreign producers with the aim of raising the cost of foreign steel to downstream, steel-consuming U.S. industries, such as appliance, automobile, and pipe and tube manufacturers. Often testifying in hearings before the U.S. International Trade Commission, where Lighthizer argued for the imposition of tariffs, was Dan DiMicco, in his capacity as Nucor CEO. It’s not that the steel industry isn’t entitled to its day in court. The problem is that the industry’s interests are so overrepresented in Washington. After all, “primary metal” manufacturing (which is a sector that includes more than just steel-making) accounted for $56 billion of value-added output last year. That’s a lot – until you recall that total value-added in the U.S. economy last year (GDP) was over $18 trillion. In other words, the direction of the administration’s trade policy is being shaped by two men who speak on behalf of interests that account for less than 0.3 percent of the U.S. economy. What about agricultural interests? What about the tech industry? Pharmaceuticals? Equipment manufacturers? Professional services? Will the interests of the other 99.7 percent of the U.S. economy have a voice in the formulation of trade policy? Most of us don’t live in Allentown. 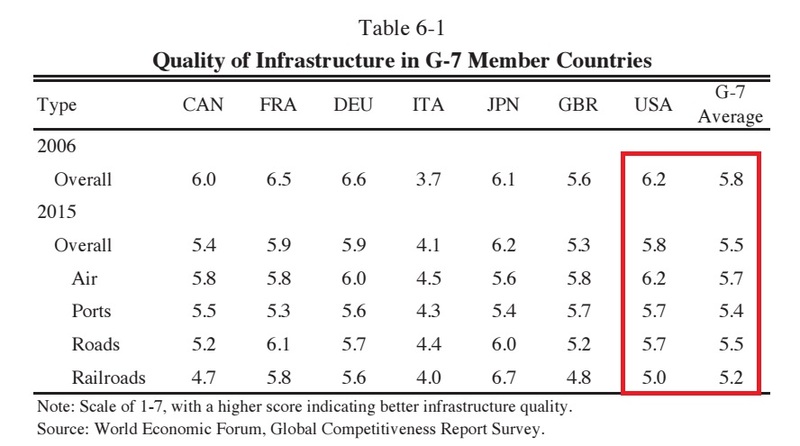 FRIEDMAN FRIDAY Trump Administration’s Infrastructure Initiative should include more private-sector involvement!!! Trump Administration’s Infrastructure Initiative should include more private-sector involvement!! !